Because we live in the bounteous Fruit Belt I suppose I am a bit jaded about what the average person pays for fruit. (One of the final straws of our moving from Minnesota was the $48 pricetag on a peck (half bushel) of Macintosh apples.) I’m even more jaded now that I get much of my fruit for free. Did you know that Michigan, after California, has the most diverse acreage for growing things in the U.S.? It’s true. Agricultural commodities, from elk to ginseng to cranberries to wheat to apples and our famous cherries, we do grow a lot of stuff here. Considering most folks associate Michigan with our top-of-the-bottom lists (unemployment, home mortgage failures, etc. ), I think folks should also know what we do right. So Saturday we actually “went retail” and visited a local U-Pick apple orchard. (U-Pick: isn’t that the oddest term ever.) 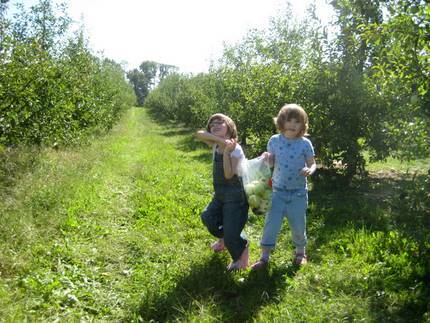 Of course, most places can’t *just* let you pick apples. Nope. You can fish, run through a corn maze, get your face painted, listen to live music or tumble in one of those moonwalk things (that is, you can if you are small), and of course go on a hayride. Eat cinnamon donuts, or a caramel apple, or a hotdog, and of course drink lots of fresh cider. It was all a bit much for me, including the price for picking three pecks of apples ($24). Then I realized that was a sixth of what the Minnesota farm wanted for the same apples, so I bucked up and paid them. The girls sure had fun picking them though. We picked apples this weekend as well though the price for our three pecks was $78 (and I’m guessing our pecks were closer to peck and a halves given what we did to the bags, but still). One of the things that struck me was that the pick your own locations had stopped being about picking fruit and become entertainment and I guess that’s an uneasy marriage of standard commerce and some kind of local conscience. We were put off at having to wait for a tractor so we started to walk up the hill following the signs to that days picking location. We were stopped by the tractor on the way back, told not to move and then picked up in a golf cart and carried the next 300 feet around the bend where we were informed that we’d never have found them which I suppose might have been possible if we’d stopped reading the signs. In any event I am still glad it’s there because it is significantly less expensive (you do not want to know what we would pay at the farmers market, the stop and shop, the whole foods and then the balduccis in that order) and the footprint is minimal. But I do recall that the last time I picked apples was a few years back and thirty-five/forty miles Northish and we just pulled over at some barely maintained orchard with big big trees (not these little bitty grafted things) and picked what we could reach paying no more than $8 for everything we could carry back to the car. And this is a good bit of the reason I turn inward (or outward?) at my own back yard. Sounds like a bargain for a day of fun for the family and some yummy local apples! I’ll have to keep an eye out for Michigan fruit, as it’s clearly more local for me (in the St Louis area) than California produce. I haven’t been to one of the You (I can’t make myself do the U)-Pick-it places since my kids were little. I think I’ll get into my car and travel to my nearest kid and pick some apples. I won’t even think about footprints that day. We used to do U-Pick blueberries right outside of Baroda growing up. I think more went into my mouth than my bucket. Then I started picking for money. You are fortunate to have such choices. What fun. I did that with my kids when they were small. Here in this area that I live in now, I can not find an u-pick place. I plan to grow my own some day. Have a great day. Alecto, good, I am glad to learn it is not just me who thinks this is nuts. Like the kids are going to say “No! Don’t stop at that orchard, there’s no moonwalk!” and throw a fit or something. We experienced, too, a rather Byzantine method of getting around, as they wouldn’t let us carry our apples back to the entry: they needed to be ferried by the cute sunburned boys with the golf carts. Sigh. I think you need to go north-ish and try it again. We only did it because we had friends in town; it is not a repeatable experience. Lori, do keep your eye out. I think Michigan should toot its own horn more than it does, there’s so much here besides the stupid auto industry. Ack, Jules, nothing more tiresome than blueberry picking in my mind. Again, it’s probably because I had to do it as a kid. Nah, now I just pick up the gigantic boxes. When the kid gets bigger though we are going to try the strawberry/blueberry picking route. Now it’s an attention-span thing 😉 But yes, we know we’re fortunate, it’s one of the things that drew us back here!! Grammy nothing’s better than your own! Even ours with their little spots and worm holes. Just to know I could gorge myself at will is just a certain kind of richness. Go check out http://localharvest.org !! Erica, I loved Minnesota but its weather did kind of make me nuts, and I really couldn’t go through a winter with a toddler in the house so we moved! My hat is off to you as you obviously take that weather on with aplomb. I do miss Minneapolis. Just not between Nov-Apr.! Marcie, nope, not yet. Not too far away and our good blogging friend and great food champion Ed has just made a great write-up for O Magazine about the orchard. It’s not too far away from us, but it’s country-road-no-direct-way far.